TIMETOACT GROUP provides professional services for IBM Software, Microsoft Software, Google Software and open standards. The group includes the companies edcom, BLUETRADE, CLOUDPILOTS, novaCapta, TIMETOACT and X-INTEGRATE. 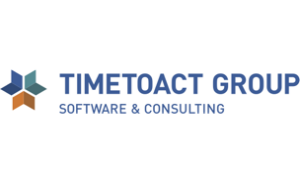 With more than 200 employees, TIMETOACT GROUP is one of the largest IBM Software Services providers in DACH. TIMETOACT GROUP is located in several locations in Germany, Austria, Switzerland and the Netherlands.